Making your own sausage is nothing to be scared of. It’s easy, delicious and you know exactly what’s going into it. No fillers. No preservatives. 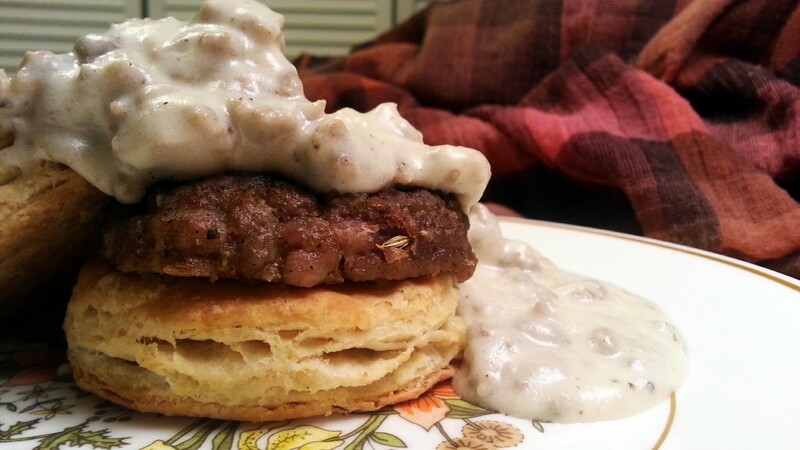 I made breakfast sausage patties, home-made biscuits and sausage gravy this weekend and it sure hit the spot. My sister, Liz, is a renowned sausage enthusiast and she loved it! In this recipe, I used ground pork. This is totally optional. I’ve used ground turkey, chicken and beef. And they are all comparatively delish. I also made the sausage into patties. This is also optional. You can find sausage casings in all varieties at your local butcher shop or meat market. No, you don’t need an expensive machine or special equipment. Using a pastry bag or gallon-sized zip-lock bag, pipe the sausage meat mixture into the casings. Impressive huh? Yes, I know. I never cease to amaze myself. – 1 1/2 tsp crushed fennel – if you only have fennel seeds, give them a good rub between your fingers or crush in a mortar and pestal. In a large bowl, combine all ingredients. Mix that egg white in well. It’ll fight ya, but you’ll persever. Cover the bowl with plastic wrap and place in the fridge for at least 15 minutes. Begin by sifting the first five ingredients together in a large bowl. Making sure the butter and shortening are very cold (I put mine in the freezer for about 30 minutes prior to use) dice into small chunks. Place butter/shortening into the bowl with the flour. Cut the cold butter/shortening into the flour. Use a pastry cutter, a fork or your fingers until pea-sized balls form and the mixture looks crumbly. **If you use your fingers, work quickly! Your hands are warm and you want the butter/shortening to stay cold. This is what makes the biscuits light, fluffy and flaky. Make a well into the flour/fat mixture and pour in the buttermilk. Lightly mix until a clumpy dough forms. If it’s too wet, add a little flour. Too dry? Add a little buttermilk. On a floured surface press dough out until it’s about 1/2 thick. You don’t need to knead the dough nor do you need a rolling-pin. Try not to over work the dough. Using a biscuit cutter or a drinking glass, cut your biscuits out. Press extra dough together to cut out more biscuits. Try to make 12! So everybody can get at least two. Be fair now! Place biscuits on an un-greased baking sheet and bake on 450 degrees for 10-12 minutes or until they are a nice golden brown. Okay, whew! You got it going on! You’re almost done. Okay, now you have two options. You can crumble all of the sausage for the gravy or you can make 6 small patties and use the remaining sausage in the gravy. This is totally up to you. In a large skillet set on med-high, brown sausage until it’s no longer pink. You can cook the crumbled sausage and sausage patties in the same pan. Turn the skillet temperature down to medium. Little by little, add the flour to the sausage and stir continuously. When all of the flour is soaked up into the sausage, cook about one minute longer. Next, pour in the milk and stir. Top a biscuit with a patty and smother on that gravy. This entry was posted in Breakfast/Brunch, Food, Recipes, Sauces and tagged biscuits, breakfast, breakfast sausage patties, country gravy, ground pork, homemade sausage, sausage casings, sausage gravy, sausage patties. Bookmark the permalink. Thank you 🙂 You’ll never buy store bought sausage again!